Beginning with Patch Set 8, the software follows a two-tier architecture model. It consists of two distinct layers: client and agent, as shown below. Note - Previous versions of the software supported a BUI interface. 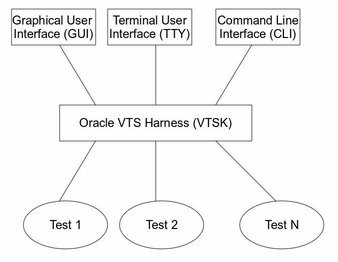 As of Oracle VTS 7.0, Patch Set 8, the BUI interface is no longer available. Instead, a GUI is provided. For instructions on using the BUI with earlier versions of the software, refer to the Sun VTS 7.0 Software User's Guide. Client layer: Consists of the user interfaces for the software. Three different user interfaces are supported: the GUI, TTY, and CLI. Like the test, the vtsk process needs to be run on the machine under test.